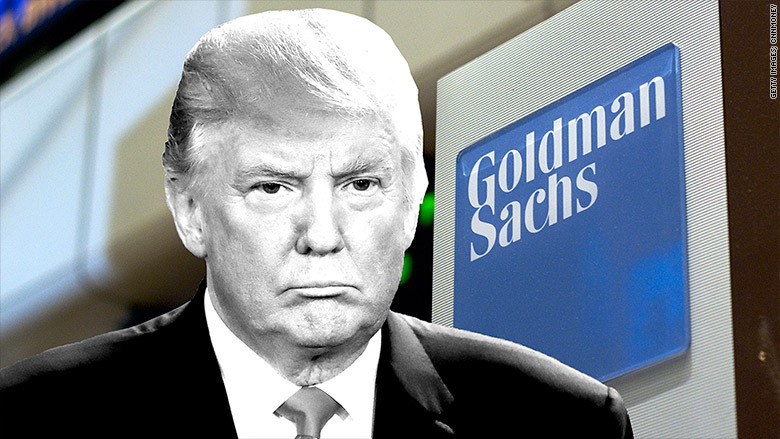 During the campaign, Donald Trump held up Goldman Sachs as a villain and symbol of the corrupt establishment. Trump's closing campaign ad flashed an ominous image of Goldman Sachs CEO Lloyd Blankfein just as Trump condemned the "global power structure" for robbing America's working class and enriching the elite. Yet now, the president-elect is leaning on several former Goldman Sachs executives to help him run the country after he takes over in January. 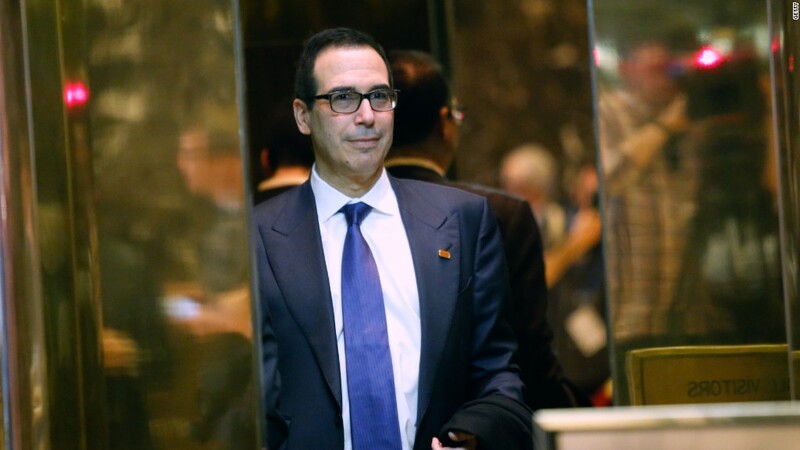 This week, Trump named former Goldman Sachs partner Steve Mnuchin to the powerful Cabinet position of Treasury secretary. He is said to be considering Goldman's current No. 2 exec Gary Cohn to lead the Office of Management and Budget, Politico reports. And who can forget that Steve Bannon, Trump's chief strategist, also worked at Goldman at one time. This is the same Trump who said Goldman Sachs had "total, total control" over his rivals Hillary Clinton and Ted Cruz. And he often referenced Clinton's speeches to Goldman Sachs (GS), accusing her of meeting "in secret with international banks to plot the destruction of U.S. sovereignty." Trump has run as an anti-establishment candidate and Goldman represents the establishment to many. After all, President George W. Bush famously tapped then-Goldman CEO Hank Paulson to lead Treasury in 2006 and President Bill Clinton named Robert Rubin, another longtime Goldman exec, to lead Treasury. "On the campaign trail, he ripped Wall Street and vowed not to let Wall Street control the country. Yet he picks a former Goldman Sachs partner as Treasury secretary," Jaret Seiberg, a Cowen & Co. analyst, wrote in a note on Wednesday. It's true that Mnuchin hasn't worked at Goldman in over a dozen years and these days he's better known for bankrolling films like American Sniper and buying the assets of failed bank Indymac on the cheap. But Mnuchin did spend nearly two decades at Goldman Sachs, reportedly making a fortune of $46 million while there. Mnuchin is also literally a child of Wall Street as his father worked at Goldman before he did. Trump also met with Cohn on Tuesday at Trump Tower, GOP officials confirmed. The meeting came just before Trump selected Mnuchin as his Treasury pick. Trump is also reportedly considering Anthony Scaramucci for another top post. Before founding his own hedge fund, Scaramucci had two stints at Goldman Sachs, most recently as vice president in private wealth management. Scaramucci was a leader on Trump's finance committee during the presidential campaign and after the election he joined the billionaire's transition team. And Bannon, who is best known for leading Breitbart, worked as an M&A banker at Goldman back in the 1980s. Yet Bannon isn't exactly a friend of Wall Street these days. He's turned into a critic of the industry. In 2014, Bannon told Buzzfeed the financial crisis was driven by "greed" and pushed to reform the system. "You really need to go back and make banks do what they do: Commercial banks lend money, and investment banks invest in entrepreneurs and to get away from this trading," Bannon said. Wall Street certainly believes that Trump will be a friend. Since Trump's election, big bank stocks are skyrocketing on hopes that Trump will dial back or even kill the Dodd-Frank financial reform regime. Goldman itself is on quite a roll since Trump's victory. The company's share price has skyrocketed 21% since Election Day, crushing the broader market's gains and leading many other big bank stocks. Ironically, Goldman's top boss wasn't exactly a fan of Trump. A year ago Blankfein, the CEO of Goldman, said the idea of Trump having his "finger on the button blows my mind." In any case, now that Trump is president and has hired several Goldman veterans does it mean he will go soft on the big banks? It's too early to say. Seiberg, the Cowen analyst, argues the opposite. Mnuchin's "Goldman Sachs lineage might force him to be tough on the mega banks to show he isn't caving to Wall Street," he said.